The move was a nightmarish fire drill trying to evacuate the house before the new tenant's arrival. After a brutal all-nighter, when the painters arrived I had to relocate my remaining belongings to the back deck, trying to cover them from the rain with plastic. Now I can hardly find anything, and my belongings are scattered in boxes (some) and garbage bags (mostly) among the boat, my car, and my office. October 2 marked our first night aboard. Feels like camping right now... very limited power until my shore power outlets are fixed, no where in the boat to even sit down until I remove all the junk and trash and do some serious scrubbing. I think I need to get some Vicks to put under my nose like a medical examiner, don my industrial-strength rubber gloves, and just scour every surface without mercy. The cats seem to like the boat. 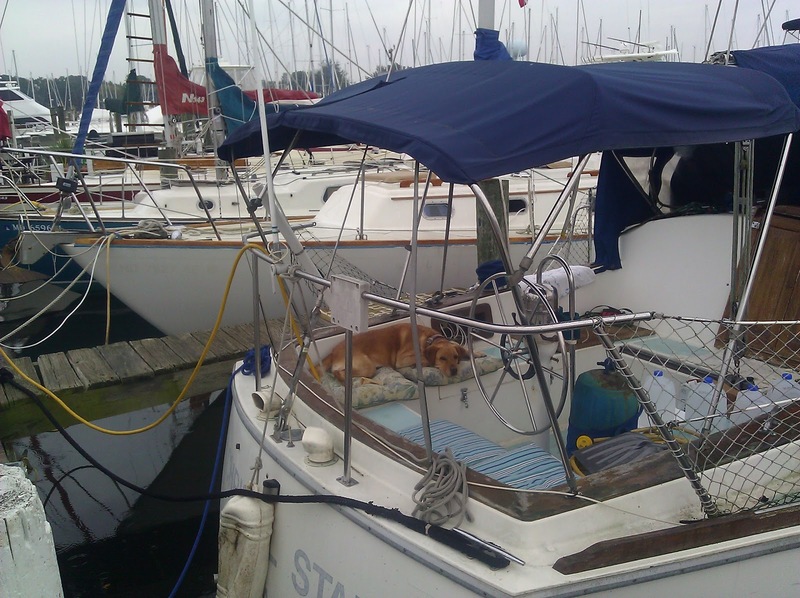 Hunter is pleased to just hang out and snooze in the V-berth all day, and has not attempted to wander top-sides. Maximus is an explorer and always wants to know about every nook and cranny in any new place. Once he had mapped out the interior he made a dash out the hatch and took a stroll to the bow and back down the starboard side deck. Not long after, he summarily leaped from the stern across several feet of water and docklines and strolled down to the end of the dock. Since they are lifelong inside-only cats, his antics made me extremely nervous. I am less worried about a cat overboard incident than Max taking off on shore and getting lost or hit by a car. 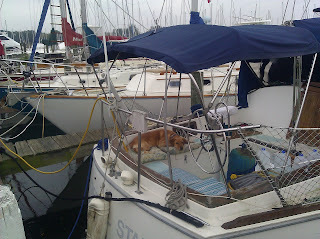 Buttercup had a lot of trepidation about the narrow finger dock and getting on and off the boat. Now that she has befriended the other dock dogs, she seems to have mastered hopping on and off and when a hind leg slipped overboard last night just kept going unfazed. Entering the cabin is another story. Buttercup dislikes stairs generally, and the steep open steps into the cabin are clearly no exception. The first night aboard friends helped me and we basically forced her down them. I had to drape the steps with a towel to get her back up them the next morning. She has refused to go back down the stairs since and has spent the past two nights sleeping in the cockpit. Last night I left her dinner sitting in a bowl at the bottom of the stairs but her fear trumped her hunger.